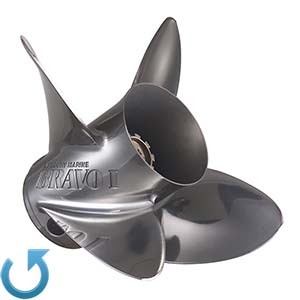 Mercury racing polished lab finished vented Bravo 1 propellers designed for high-performance, high gearcase height -stroke outboard applications. Excellent top speeds, great handling, good mid-range speeds and awesome planing performance for Flats, Bass boats, Vee, or Step hulls. The dual adjustable PVS vent holes per blade provide ventilation to rev up the outboard for planing performance. Propellers equipped with a long barrel.